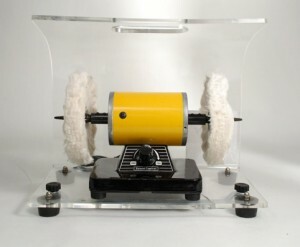 Compact, durable and long-lasting, this buffer polisher has a dust shroud and offers simple on/off operation. The specially designed rag wheel can be used to highly buff/polish lenses without damaging even A/R coated lenses. The other side features a felt wheel that can be used for polishing Polycarbonate lenses and removing scratches from Zyl frames. The unit comes complete with a special polishing rouge compound designed for CR-39, High Index and Polycarbonate lens materials which decreases polish time by 20%.